Dr. Comeau and staff will meet with you one-on-one for your initial consultation. They will review what type of fat loss you’re looking for to help re-shape your body. During the process, together you will look at your body from various angles, focusing on the specific areas in which you’re interested in losing fat. Everyone has a different body shape. For that reason, CoolSculpting has developed a variety of applicators to accommodate as many areas as possible. 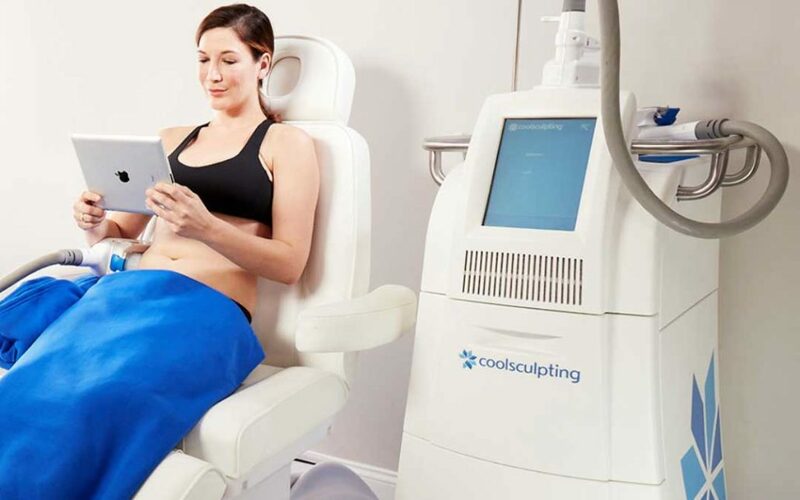 During your initial consultation, we’ll take a look at the CoolSculpting machine and applicators, and Dr. Comeau and her staff will explain how they work to eliminate stubborn fat. Depending on your body type and the fat loss you’re looking for, Dr. Comeau will recommend the number of treatments you will need. In many cases, desired fat loss is achieved in just on treatment! When you arrive for your CoolSculpting treatment, a staff member will review the procedure and how long it will take. Then, “before” photos are taken so that you and Dr. Comeau will be able to tell how successful your first treatment is. Don’t worry – we’ll only photograph the treatment area, and will never use your photo without prior consent. One the photos are taken, a member of Dr. Comeau’s staff will mark the area to be treated so that we can properly fit the applicator. You will then be escorted to the treatment room, where you will be comfortably positioned for treatment. You’ll even have the option to watch television or close your eyes for a rest during treatment! Once you are in position and comfortable, a gel pad and applicator will be positioned in the target area. It is the CoolSculpting applicator that delivers the magic – targeted, permanent fat loss! As the name implies, CoolSculpting is cool! You will feel a chilly sensation in the treatment area as the applicator reaches its ‘freezing’ point. That sensation usually goes away in 10 or 15 minutes, and the treatment area will become numb. During treatment, we offer blankets and slippers to help keep you warm. The CoolSculpting applicator uses a vacuum to draw the fatty area into the applicator cup. You may feel some slight tugging or pulling, which should not be painful. Relax! You will need to keep still during treatment so as not to dislocate the applicator. Most patients bring their cell phones to check e-mail or play games. We also have NetFlix available so you can catch up on a favorite show. Or simply close your eyes and take the opportunity to catch up on some rest. The CoolSculpting Treatment is Complete – Now What? CoolSculpting is non-invasive, and there is no downtime. You can resume all normal activities immediately following treatment. Go back to work, get the kids, head home, go to the gym – it’s up to you! The treatment area may feel numb for a while, however that should not impact your normal activities. Immediately following treatment, the area(s) treated will likely feel numb. This will subside, and the area may become red, show some signs of swelling, and may feel tingly, itchy or tender. If you had a double chin treatment, you may experience a sensation of fullness in the back of your throat. All of these side effects are temporary, and should resolve themselves within a few days or up to a week or two. Consult the CoolSculpting website for more information on side effects. Patients have reported seeing results as early as 3 weeks. Full results are generally seen between 4 and 12 weeks. Schedule a no-obligation CoolSculpting consultation with Dr. Beth Comeau and staff by calling 410-733-1877, or by e-mail at frontdesk@bethcomeaumd.com. Dr. Comeau also holds CoolSculpting events periodically where you can see a CoolSculpting procedure in person. Follow our Facebook page at www.fb.com/drbethcomeau to see upcoming events. Address: 11054 Dorsch Farm Rd. NOTE: Some evening hours are available - Please call to schedule. If visiting our office for product, please call prior to arrival to ensure that our office is open.